Based on the highly regarded non-abrasive pink pre-wax cleanser, but with added heavy grade diminishing abrasives for successful removal of heavy swirls and scratches on older, abused or oxidised paint of all types, and for serious paint correction. Regarded as providing similar cut to Menzerna 203S. Recommended best applied by DA by professionals or experienced enthusiasts. I used pre wax pro on a very tired car this week and was absolutely staggered by how well it work. Serious scratches and major defects were made mincemeat of in no time at all. I'd be confident in saying you could complete a 90% correction with this product. 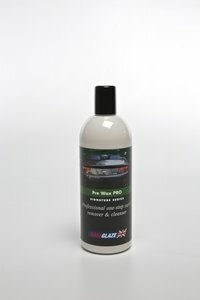 If you have tired paint that needs a lot of TLC then pre wax pro is definitely worth a go. For best results follow up with the medium cut cleanser to enhance the finish. I love this product. "Thanks for the email update, refreshingly great service."